There are more and more options to white or wheat flour these days, but how do you cook with them? A nutritionist shares her tips. Long gone are the days of having only white and whole wheat flour options on grocery store shelves. Not only do the many flour options allow for a variety of textures, flavors and nutrients, but they also make enjoying many of life’s simple food pleasures a viable option for those with food allergies and intolerances. Almond flour is naturally gluten-free as it’s made from only finely ground blanched almonds (or from your leftover homemade almond milk pulp!). It's a good source of protein and also grain-free, making it helpful for those who stick to a paleo diet. Almonds are high in vitamin E (known for being a powerful antioxidant) and calcium (notorious for its contribution to good bone health). Almond flour has a variety of uses including being put into baked goods and making “breadcrumbs,” and it has a 1-to-1 replacement for regular white flour which makes it user-friendly too. 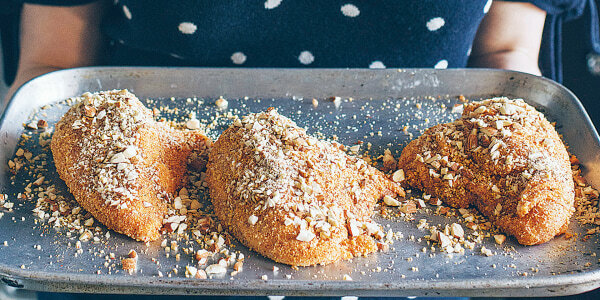 My favorite way to use almond flour? I make a healthy and delicious version of everyone’s favorite: fried pickles. Coconut flour is made from coconut pulp that has been dried and ground and is another gluten-free, low-carb option. It’s a good source of fiber which helps you stay full and also helps keep your gut healthy. It’s higher in saturated fat than other flour options and is known for its ability to absorb liquids, so it’s best used when seeking a denser texture in a recipe and in combination with other flours like almond. My recommendation? Use it in a breading for fish, chicken, tofu or shrimp. And, its super subtle coconut flavor is perfect for paleo chocolate chip cookies. This is made of, you guessed it, finely ground dried chickpeas. It’s gluten- and nut-free and is full of folate (important for cardiovascular health), fiber (for gut health) and B vitamins (necessary for a healthy metabolism). It’s also a smart option for your wallet. Chickpea flour does have a stronger, earthier and nutty flavor compared to other flours, but can be used in sweet and savory dishes alike. It’s great in falafel or corn muffins, and can even be combined with just water and spices to make socca, also known as chickpea flatbread. Cassava is also commonly known as yucca, a well known root vegetable in South America. The flour is made from grating and drying the whole root. Similar to chickpea flour, it’s a gluten- and nut-free option that’s affordable and versatile. If you’re watching your weight, cassava is a good option because it’s typically lower in calories than other flour options. It’s also high in vitamin C, which acts as an antioxidant to help relieve stress, support your immune system and can contribute to skin health. It’s mild in flavor, and can be used to thicken sauces, in bread recipes, or in tortillas. But my favorite way to use it? Cook desserts with it. You really can’t go wrong with these sweet potato pie cookies. Spelt is an ancient grain, a "cousin" if you will to modern wheat. It does contain gluten, but is thought to be more easily digested than its modern counterpart. It’s higher than wheat flour in vitamin K and selenium and can be easily swapped out for the same amounts of wheat flour in any recipe, while at the same time making the density a bit lighter. The options for working spelt flour into your cooking are endless, but I’m partial to these apricot cinnamon scones. For more tips on living a nutritious life, follow Keri Glassman on Instagram. For more diet and fitness advice, sign up for our One Small Thing newsletter!